So, this recipe really is for those nights you have absolutely no time. It's nutritious, filling, tasty, prepped in about 2 minutes, and can be eaten by Mummy and Daddy too as it is, or it can be tweaked a little once the munchkin's are in bed for a bit more specialness. 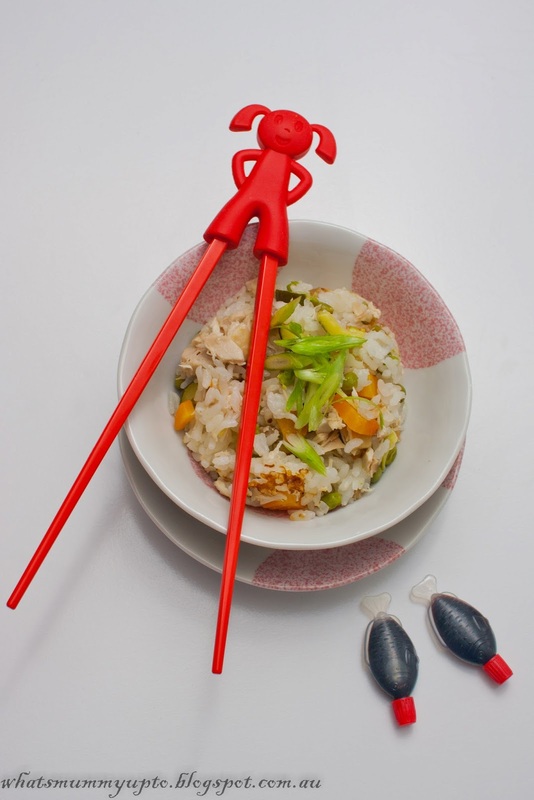 It's chicken rice .... well at least that's what we call it, and it has nothing to do with the Malaysian Chicken-Rice dish ... and it doesn't have to be done with chicken. In fact, it can be done with pretty much any protein. 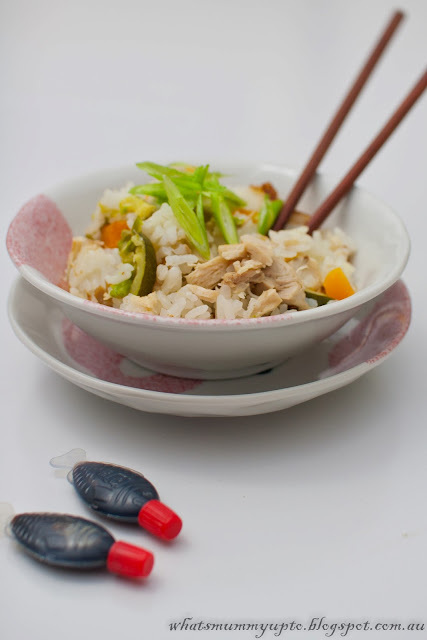 I've put this recipe directly following the slow-cooker chicken recipe in my School Night Dinner Series, because it's a great use for the leftovers from that dish. 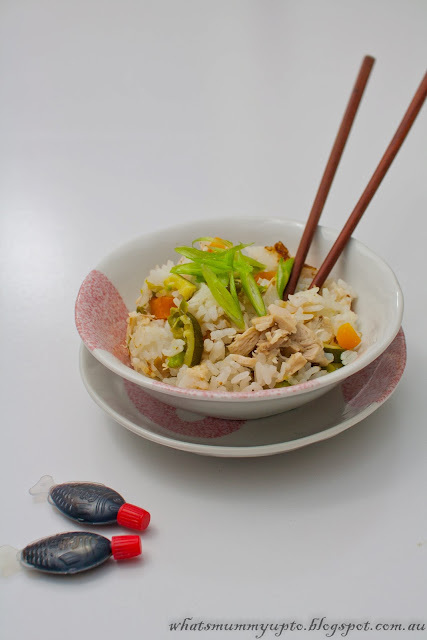 I use my electric rice-cooker for this dish, but you could totally do this in a pot on the stove ... just need to keep an eye on it so you catch it once the liquid has all absorbed, but before it's burnt! The beauty of an electric rice cooker is that it automatically switches off once it's done. - 1 chicken breast (or equivalent of another protein), either pre-cooked or uncooked work well. The cooking time is enough to cook the raw protein, provided you dice it nice and small. We've also used left-over corned silverside, leftover beef steak, and it also works with tuna or salmon (canned or fresh). - 1/2 salt reduced chicken stock cube. 1. 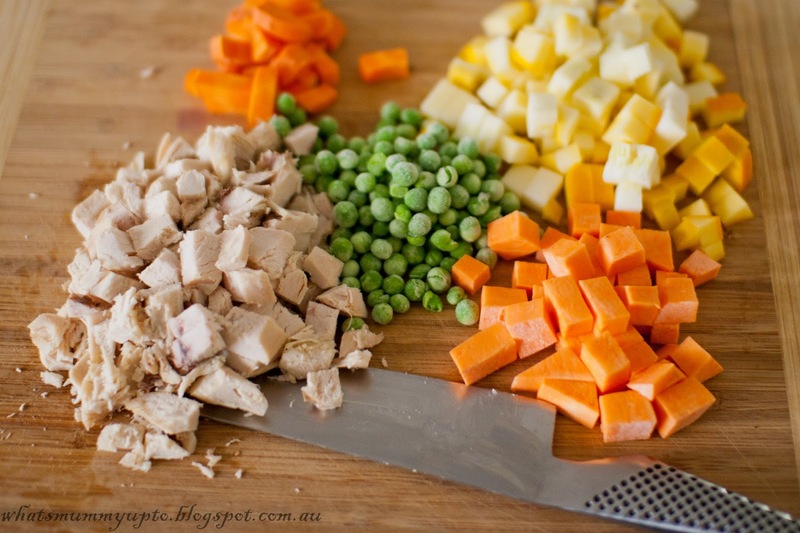 Dice Chicken and vegetables into 1/2 inch cubes. 2. 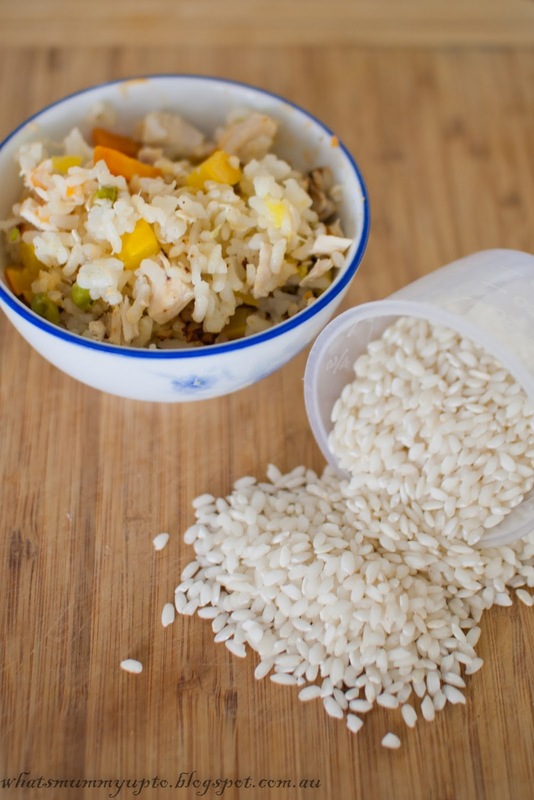 Place rice and water into rice-cooker or pot. Mix in vegetables and chicken, then break up the half stock-cube and mix in. 3. 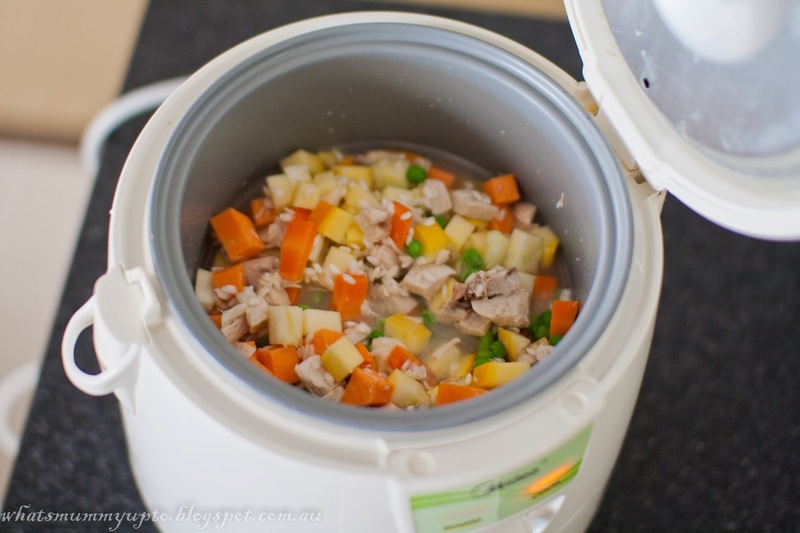 Cook until the slow-cooker switches off ... no need to check it during cooking. However, if you're using a pot, cover and place on high heat. Check it after 10 minutes and give it a little stir, then put the lid back on. Check it every couple of minutes after that. It's done when all the liquid is gone. Cooking time in rice-cooker or on the stove will be about 15 - 20 minutes. DONE! Yep, it really is that simple. Once again my girls LOVE this one, and Hannah even eats the visible veggies too ... GASP! If you want to special-it-up a little for Mummy and Daddy, tip the cooked Chicken Rice into a pot. Add an extra 1/2 cup water and cook stirring until this is absorbed. Add 1-2 Tablespoons of butter (as per you preference) and a generous handful of grated cheese (we generally use tasty cheese), and some salt and pepper to taste. Stir until it's combined, then serve with some diced shallots on top .... it's a cheat risotto-ey kind of thing, and is super yum! Hope you enjoy this one! Oh, and I'd love to know if anyone has tried any of the recipes yet. The last two are here and here. Did you make it? Did it work? Did you like it? More importantly, did the kids eat it?